1987 was the golden age of graphics on the Spectrum. And the 6-PAK Volume 2 compilation included some prime examples, featuring nazi-Gauntlet variant Into the Eagle’s Nest, a great shooter called Light Force, an average flight sim called ACE, the classic International Karate, better-than-Arkanoid Batty, and the stunning Shockway Rider. I got 6-PAK Volume 2 for Christmas that year. Also memorable for seeing my beloved Ghostbusters for the first time when it premiered on ITV on Boxing Day! 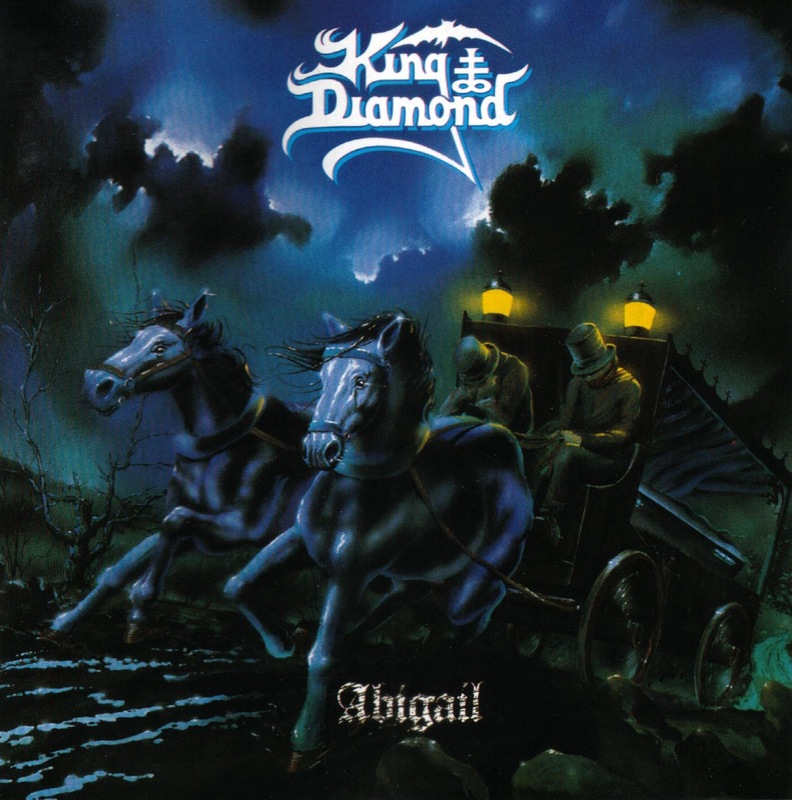 And my Grandma buying me Abigail by King Diamond. I’ve no idea how she knew I wanted it, and much less what the shop assistant must have thought when a 62-year old Irish lady turned up at the counter to buy it… or more likely ask for it! But it was something that I immediately fell in love with, and I reckon I’ve listened to at least once per month for the last thirty years, the last time being on my flight to California just a couple of weeks ago. I’d discovered King Diamond in a friend’s copy of Kerrang – a pull out poster of him in full make-up holding a burning upside down cross; that got unfolded in religious education right in the face of the most Catholic of our Catholic school teachers! He got kicked out of the class, the poster got confiscated, and my world moved forward… I can distinctly remember my first listen of Abigail, as soon as we got home from my Grandma’s house on Christmas Day evening. Standing at the record player in a pair of big seventies can headphones (because the lead wouldn’t reach a chair), marvelling at the spine-chilling tale unfolding through every track. It’s a masterpiece, and there’s no finer (or gloriously terrifying) opener to any album ever! I know most of you will never have heard of this, which I pity you for, but just give the opening 40 seconds a go! But back to Shockway Rider… The name came from a 70’s sci-fi novel, but to me the premise was more than a bit Judge Dredd – the inlay even talked about cruising the triple-speed walkways that circled the “Megacitys of the 21st Century.” (I quote to avoid any responsibility for bad punctuation). 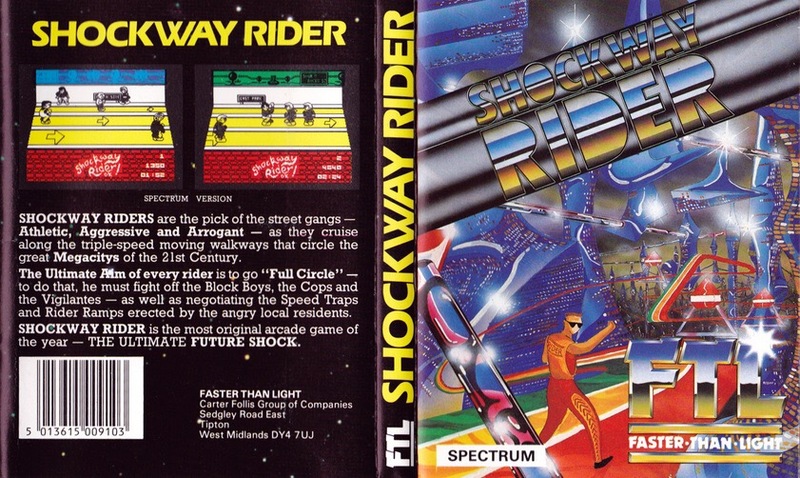 Anyway, you’re part of the Shockway Riders, an athletic, aggressive and arrogant street gang, on the cruise to do a full circle of the moving walkway that did indeed move at three speeds, and contained ramps, speed traps, cops, vigilantes and other gangs trying to thwart your “ultimate ambition” to go all the way around… Yes, the story wasn’t its strong point! What was its strong point was how bold and vibrant it looked, with big, detailed, varied sprites on a bright yellow background. Once you’d jumped off the pavement onto the walkway, the challenge soon mounted as you swapped lanes to collect stuff to chuck at your oncoming enemies, avoiding the obstacles and other pedestrians, who had a habit of morphing into enemies without warning! Actually, swapping lanes was probably the biggest challenge – jump timing wasn’t exactly forgiving. That was slightly compensated by the death animation though – once you’d inexplicably exploded, all that was left was your head on the conveyor belt you died on. There wasn’t a massive amount of progression – I think the backgrounds changed and the obstacles changed as you went from block to block – but it stayed true to its simple concept and that continues to be its strength. In April 1983, Home Computing Weekly awarded this 100% for graphics. The first time I laid eyes on it, I probably concurred – another of those moments when you realise that your machine is no longer at the cutting edge; actually, I seem to remember quite a few of those moments with my VIC-20! 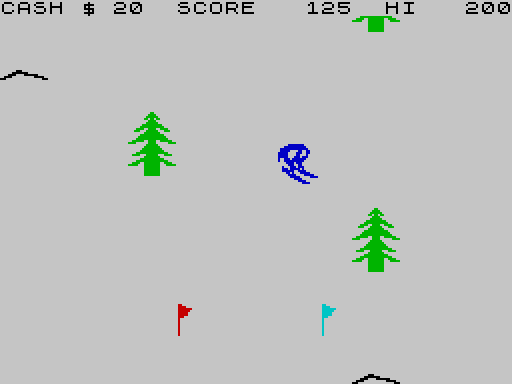 Horace Goes Skiing was the first game I ever played on a Spectrum. It came out in 1982 but April 1983 was probably about the time I played it, just after my best friend (and future best man) Paul’s eleventh birthday. And just as my favourite band of the day, Spanish Ballet, hit number one and the big time with True. There were some really striking things about the Spectrum. It was tiny compared to VIC. You could attach any cassette player to it. And it made the strangest digitised screeching sounds you’d ever heard when you loaded a game! Little did I know that I’d soon know every nuance of those loading sounds as intimately as I’d know the sax solo in True! After a particularly garish loading screen, perfectly complementing the garish sounds coming out of the speaker, you’ve got to get Horace across the road to the ski shop. This is a particularly brutal, but great looking take on Frogger. You start at the top of the screen with some money in your purse for ski hire. The shop is at the bottom, and in between are some fantastically detailed lorries, cars and motorbikes, moving unpredictably in both directions at a serious pace. Get hit and an ambulance takes you back to the start, for a price. If you’re left without cash for ski hire, you charge around the road to be rewarded for your recklessness! Get across with enough money and it’s time to hit the slopes. I’ve played a ton of skiing games in my time, and this controls as well as any I’ve played. Despite reverting to slightly less impressive graphics for this stage – in fact, VIC could have managed these – you really felt like you were on snow. Hitting every gate was tough, especially when they were placed right behind a tree, but most of the fun was to be found on the jumps. These weren’t especially useful, but again felt so right. Apart from the bizarre jumping sound, but that sort of out of place noise was something else I’d eventually learn to love on the Spectrum! Get to the bottom and you were rewarded with doing it all again. Which was just fine! I’m not so sure about the 100% graphics score any more. It was up there for a while with games like Alcatraz Harry and that awful Artic football game, but then came Daley Thompson… which is a tale for another time! Horace Goes Skiing was simple, and by no means the best Spectrum game ever, but it was a classic and remains so to this day. 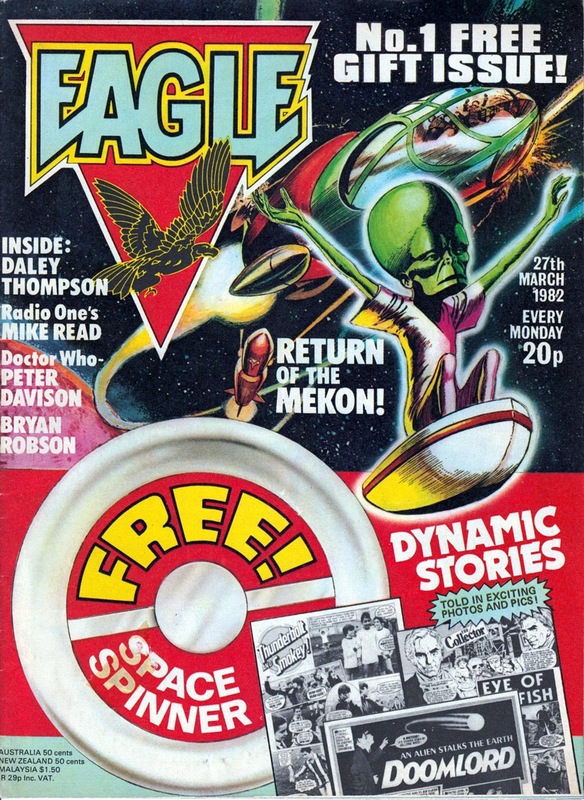 Never regret something that made you smile… I’m not sure the free Space Spinner on issue one of the relaunched Eagle comic on the 27th March 1982 made me smile enough not to regret tearing lumps out of the cover to get the sellotape off! I’d read a few old annuals that had belonged to my Dad, but this was the start of my real love for Eagle that would last several years until peer pressure would see me switch to 2000AD. It started out pretty exotic to someone who’d previously read TV Comic, Whizzer & Chips and Beano – it was full of photo stories! Yes, like girls’ comics had! But they didn’t have Sgt. Streetwise or Doomlord, the alien in a crappy rubber mask and an outfit borrowed from Liberace’s wardrobe. And, of course, Dan Dare, who thankfully kicked off in a more traditional comic strip format, with Return of the Mekon. This was the guy I knew from my Dad’s old stuff, though actually the 1982 version was his great, great grandson from 200 years in the future. The game appeared four years later. The Mekon’s returned again, this time threatening to destroy the Earth with a hollowed out asteroid. Once Dan arrives on it, you’ve got two hours to explore the subterranean structures to find five bits of a self destruct mechanism, one on each level. Lose all your energy and you’re put away for ten minutes. This all equates to running about with your laser gun, exploring and shooting Treens. Its great fun, and is a dream come true for any Eagle fan – with captions aiding the story, it feels like the comic come to life. But what really makes it come to life is how it looks; this game was utterly goundbreaking as far as the Spectrum was concerned. 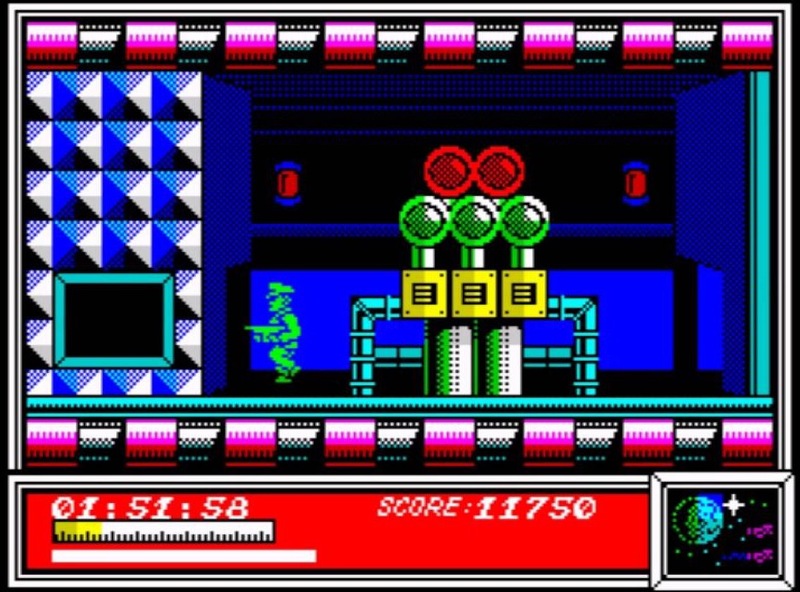 Absolutely loads of colour – probably more than any other Spectrum game at the time – and not a not a hint of clashing. The character animation is also superb, and everything runs super fast and smoothly. The whole package was a real landmark in Spectrum gaming, to the point that loading it the first time gave you that same sense of awe you’d get moving up to the next generation of machines. I don’t think I ever found all five pieces, but for the rest of my time with the Spectrum it remained close to hand (in one of those dreadful rotating tape holders), long after the comic was a distant memory, lost to Judge Dredd, Rogue Trooper and Nemesis the Warlock, whose spin-off games never quite had the same impact, though we’ll come back to those later. The same is true of Dan Dare II: Mekon’s Revenge and Dan Dare III: The Escape, despite the latter probably being the final word in colourful Spectrum games! See you next time with something from my Atari ST days. 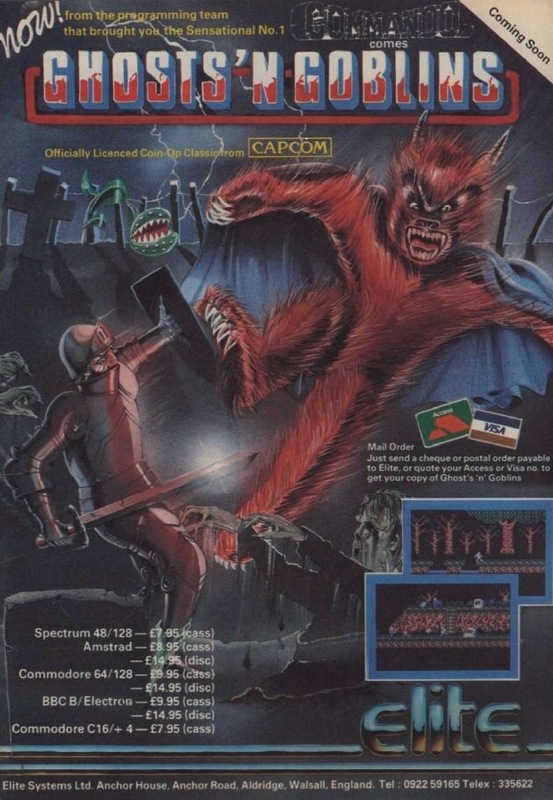 It’s high summer 1987, and after a week away from your beloved Spectrum, you’re faced with the choice of which new game you play first – Ghosts ‘n Goblins or Southern Belle (see previous post). Only ever going to be one winner, especially when you’ve spent the last couple of years reading about a stunning looking arcade game where you fight your way through a graveyard to rescue a princess from The Great Demon Lord himself! By this point, I was into Slayer and I’d seen The Omen, An American Werewolf in London and Poltergeist, and had a good idea of where my cultural bread was going to be buttered for the rest of my life, so was always going to be attracted to something like this. 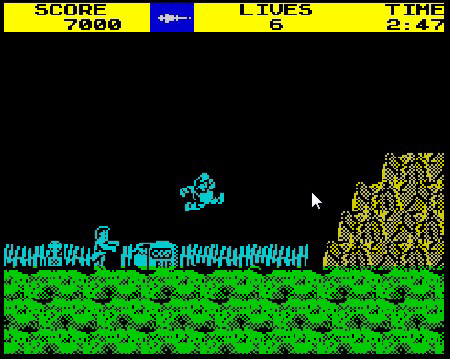 Released by Elite on home computers in 1986, this devilish platformer sees your knight in monochrome armour going from the most iconic graveyard ever to a forest, a ghost town then various bits of a castle, shooting various types of pick-up-able weapons at zombies, bats, crows, skeletons, Satan and some exotic looking demons. In reality though, you’re jumping over gravestones and shooting skeletons and zombies for a few seconds before losing your armour and running about in your pants for a bit before dying and restarting. I think at the height of my expertise I got to the first boss, a winged demon that bounced around at you. Funny thing is I never thought about it being that difficult – which retrospectively I now know it to be notoriously so in the history of gaming! I was more than happy in that graveyard, and never even considered there being more to the game than this. (Which ironically there wasn’t much more of on the Spectrum). Just die and restart without too much frustration, which is one of the many qualities that makes this a classic of the eighties on any platform and one of the best games ever. 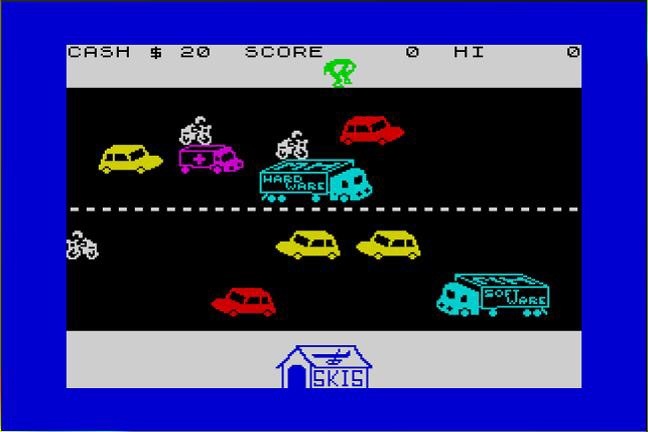 The Spectrum version looked just like the arcade, minus the colour. That’s not to say it wasn’t colourful – tons of colour clash all over the place and because Arthur took on the colour of the background, you often found yourself lost in it! Unfortunately the sound didn’t translate so well, but met the usual low expectations. It played great though, and I can still feel the stiffness of the Atari joystick as it got wrenched from left to right and back again to chuck swords at enemies coming from all sides. 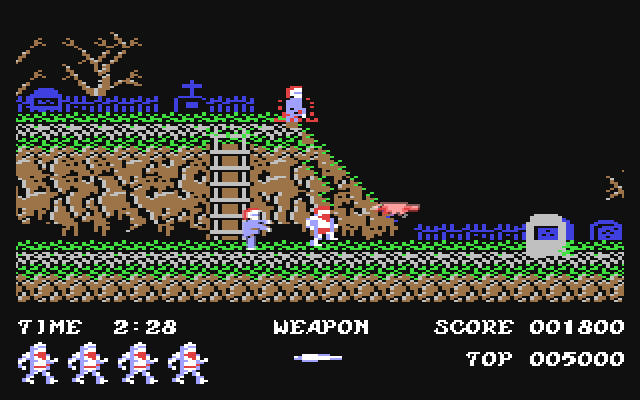 An absolute classic, until your best friend got it on C64… Now that graveyard really is iconic! British Transport Films made documentaries about British transport. Readers of a certain age might remember a couple of rail safety films they made that were sometimes rolled out – literally – on the school TV; the ones on the trolley with the big wooden doors on the screen. Their best known output, though, was surely London to Brighton in Four Minutes. TV gold at the time. And the sole reason that I ever had any interest in ever owning this “superb simulation of a dull subject” as Zzap!64 summarised in its review. That said, I’m sure this teenage nerd was just a bit excited about driving a fully 3D steam train on his Spectrum! 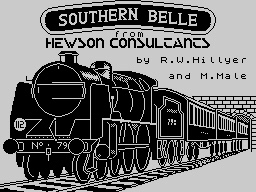 Southern Belle appeared out of Hewson in 1985. I’d seen it in C&VG and it did look like nothing I’d seen before, but it was still a train game and was quickly forgotten. I reckon it was August 1987 that it jumped out at me at a service station on the M4. Actually, it was probably the bargain price of £1.99 that jumped out at me, just after I’d noticed Ghosts ‘n Goblins (which I’ll cover next time to avoid repeating the story) at the same bargain price. We were on the way home from a holiday camp in Dorset, the only real memory of which was a shop that had a great reflective Adam Ant badge that I still wear to this day! The only other thing to say is that the rest of the journey was torture with two new games sitting on my lap for hours – there’s a limit to how long an inlay alone can excite you for! I’ll admit here, Ghosts ‘n Goblins got loaded first, but I wasn’t progressing very far very fast, so the impressive steam train loading screen soon gave way to the moment I’d been waiting for… Computer Demonstration Run mode with the London to Brighton speed run! It didn’t quite have the visual thrills of the BTF film, but it didn’t disappoint, and to this day is something to impress your friends with. If they are train spotters impressed by monochrome vector graphics running at a frame per second thirty years on. The game itself was much less of a speed run. You decide how much you want to control (I recommend not going beyond the whistle), the timetable difficulty, then you set off from Victoria Station and literally chug past a very recognisable Battersea Power Station and on your way. The rest of the trip to Brighton is less recognisable. 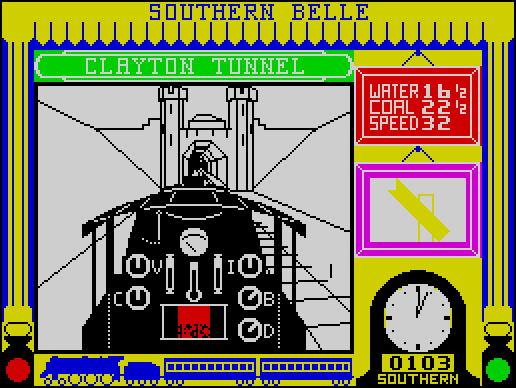 There’s some impressive tunnels but generally it’s the odd shed or signal until the next station. Just variants of black lines on a white background, with only the red fire to spice things up and keep it real. And of course the garish yellow border. I’m not sure I ever made it to Brighton. I certainly didn’t make it on time. But that wasn’t the point. You were driving a steam train, in all its glamour, in the real world. And in 1987 you didn’t need to be a train spotter to love that. See you next time when I’ll cover Arthur and his big lance.